Citrix revolutionized desktop and app delivery over 20 years ago. The need to virtualize and centralize Windows desktops and applications has not diminished, with organizations large and small continuing to select Citrix as the market leader in this space with over 400 million users connecting to a Citrix cluster. Hyperconverged infrastructure (HCI) has emerged as an effective means to drive greater efficiency and density into the IT infrastructure for these workloads and is now gaining momentum. However, organizations are also presented with many options from multiple vendors and can often make poorly informed decisions. This typically results in the deployment of over-engineered, over-provisioned clusters that do not reflect the actual performance or capacity requirements. StorMagic has worked closely with Citrix to make it easy to configure and deploy Citrix workloads to StorMagic enabled HCI clusters through the Citrix Cloud Connector; automating the process and simplifying management directly from the Citrix Cloud. Simple, cost effective HCI clusters can now be quickly deployed and managed on any industry standard server. SvSAN is a software-defined storage product, often referred to as a Virtual SAN. SvSAN turns the internal disk, flash and memory of 2 or more industry standard servers into iSCSI shared storage, thereby removing the need for an external SAN and enabling highly available hyperconverged infrastructure or server-based shared storage. StorMagic SvSAN enables simple, cost effective and flexible hyperconverged infrastructure for Citrix workloads as an alternative to costly HCI appliances or traditional storage arrays. StorMagic customers are able to meet their Citrix performance and capacity requirements today and avoid the the danger of over-provisioning, while meeting the demands of constrained budgets. 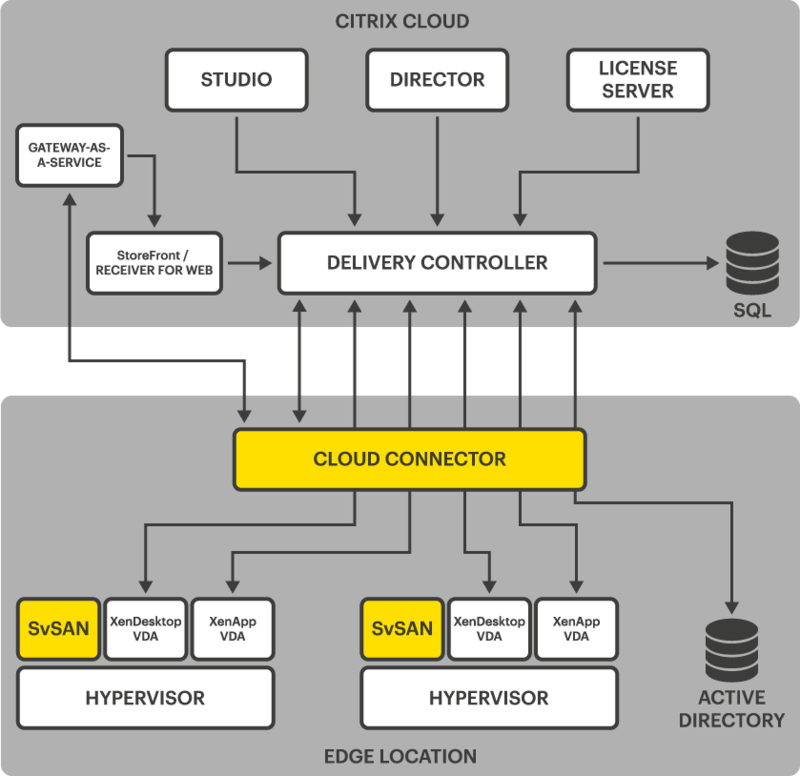 Though simple and cost effective, SvSAN is a very powerful platform for Citrix workloads. By combining SSD and memory caching with a lightweight footprint, Citrix customers can be certain they will meet their density, user count and performance demands. The Citrix Cloud Connector enables Citrix and StorMagic partners to deliver to their customers pre-configured hyperconverged appliances that automate the process of deployment and configuration. StorMagic has worked closely with Citrix to ensure that the connection to the Citrix Cloud is automated and their Citrix workloads are installed and manageable from the Citrix Cloud with minimal effort. StorMagic provides seamless integration tools to automatically provision the Citrix Cloud Connectors, connecting the on-premises HCI running Microsoft Hyper-V and VMware vSphere to Citrix Cloud as a resource location. Because StorMagic SvSAN presents active-active shared storage to the hypervisors just like a traditional SAN, VDAs, the optional local StoreFront, and any other Citrix application workloads are now agile and highly available. Using the StorMagic Workspace Appliance Connector Wizard, the manual task of configuring the Cloud Connector components is avoided by following easy onscreen instructions. This automates the download and configuration of the Citrix Cloud Connector and the connection to Citrix Cloud. The new HCI/StorMagic deployment is then simply configured as a regular hosting resource in Citrix Studio, ready to provision virtual Desktops and Apps. StorMagic Citrix Workspace Appliances are available from an accredited Citrix Solution Advisor (CSA) and StorMagic Preferred Partner (SPP). For further information, contact StorMagic at [email protected]. Unfamiliar with StorMagic SvSAN and its features and requirements? Learn more about the solution with the SvSAN data sheet. Explore how Citrix workloads can be handled using Cisco ISR 4000 routers with UCS E-Series blade servers and StorMagic SvSAN in this guide.